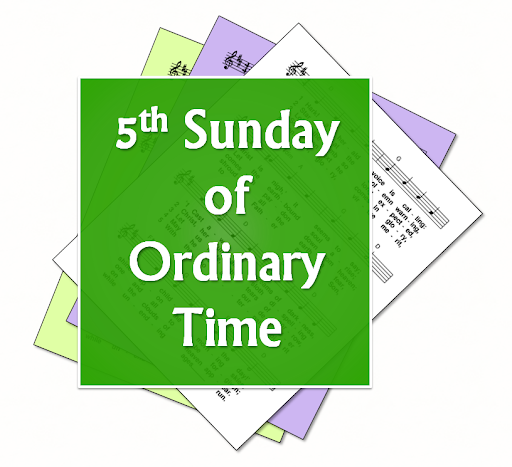 A selection of hymns and songs, based on themes from the Roman Catholic lectionary for the fifth Sunday of Ordinary Time, Year B. First: Job 7 - Is not ... life on earth nothing more than pressed service? .... Restlessly I fret 'till twilight falls ... swifter than a weaver's shuttle my days have passed. Psalm: 146 - Praise the Lord who heals the broken-hearted / Praise the Lord for he is good / The Lord builds up Jerusalem / Our Lord is great and almighty. Gospel: Mark 1 -Jesus heals: firstly Simon's mother-in-law of a fever, and then many in the town who were suffering diseases or posessed. Then he goes to a lonely place to pray - and then to the neighbouring towns to preach there too. Jesus as healer - heals the broken so they are free to serve God and God's people. The pain of suffering. The hope which healing brings. Without Christ, our lives are like drudgery.